President Trump often makes pronouncements and assertions, and then his aides scramble to try to fill in the blanks. During his rallies before the midterm elections, the president all but acknowledged that he had been claiming the “caravan” of migrants traveling from Honduras contained criminal elements without evidence. But then the Department of Homeland Security came to the rescue. With no explanation, one could simply dismiss that statistic as propaganda. But we will dissect the news release and offer some explanations for the data in it. There are several iterations of the caravan, which is slowly moving through Mexico. The high estimate for the first group was 7,000 people, but many have dropped off, so now it’s about 4,000 to 5,000 people, some traveling quickly as others go more slowly. Mexico City authorities say that of the 4,841 registered migrants receiving shelter in a sports complex, 1,726 are under 18, including 310 children under 5, the Associated Press reported Nov. 8. Mexico City is 600 miles from the U.S. border and there are perhaps an additional 4,000 people in caravans moving through southern Mexico. Notice that DHS does not refer to people in the caravan. These are people “along the caravan route,” which is more than 1,000 miles long. It also refers to individuals “in this flow,” which sounds like code for people migrating across the Honduran border. The reference to “Somalia, India, Haiti, Afghanistan, and Bangladesh” is a bit of a tell. The Mexican National Institute of Migration (INM) publishes online information regarding the nationalities of the people who cross its borders, and it is easy to find information for crossings in Tapachula, where the caravan crossed into Mexico from Guatemala. The data shows that so far this year, 28 people from Somalia, 105 people from Haiti, 10 people from Afghanistan, 1,038 people from Bangladesh and 2,940 people from India have entered Mexico in Tapachula. Leutert, who has traveled extensively along the 700-mile border of southern Mexico, said it would make “zero sense” for such nationalities to be traveling in the caravan because they qualify for an exit permit and legally can take a bus to the United States to request asylum. So, cross off the reference to these nationalities being “in the flow.” But the news release also says “more than 270 individuals along the caravan route have criminal histories.” What could that mean? The Washington Post reported in April that the United States has expanded a program to capture the biometric data of tens of thousands of Central Americans and other migrants arrested in Mexico. Officials had installed scores of screening terminals in detention facilities to collect migrants’ fingerprints, ocular scans and other identifying features. The information collected is then checked against DHS and other U.S. criminal databases. Since DHS won’t comment, we can only speculate that biometric data is being collected if migrants are being detained or perhaps if they sign up for Mexico’s new “You’re at Home” program. The program is supposed to provide shelter, medical attention, schooling and work permits to members of the caravan who agree to stay there. About 2,700 migrants are said to have received temporary visas in Mexico. Of course, then they would not be part of the caravan anymore. The news release refers to people with “criminal histories.” There are four examples given: aggravated assault with a deadly weapon, armed robbery, sexual assault on a child and assault on a woman. As it turns out, the Mexican government has announced that it had deported at least six (and possibly eight) Hondurans who were part of the caravan, based on notices from Interpol alleging murder, robbery and other crimes. All were detected in Chiapas, a southern state bordering Guatemala, shortly after they arrived in Mexican territory. Since they were deported, they obviously are not in the caravan anymore. Mexican officials on the route have told Post reporters that they haven´t seen any serious criminals. The report does not detail the crimes. But other DHS data shows that 32 percent of the undocumented immigrants deported in fiscal 2014 as “criminal aliens” were convicted of immigration crimes, such as illegal entry. Sixteen percent were removed for drug offenses, 14 percent for traffic offenses, 10 percent were removed for assault and 1.7 percent for sexual assault. In other words, because the biometric data is checked against U.S. criminal databases, a large percentage of people with “criminal histories” may simply be guilty of previously trying to enter the United States. Yet the news release highlights a sampling of violent crimes. Note that during the 2014 surge, 5 percent had criminal histories. Five percent of 4,000 to 8,000 is 200 to 400 people, or roughly the number highlighted by DHS. 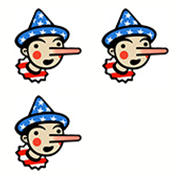 That also means that 95 percent of the people traveling in the caravan do not have criminal histories – and yet the president sent more than 5,000 U.S. troops to the border. Any crowd of 7,000 people is going to have some bad apples. Mexican officials have already identified several and deported them, so they are no longer a potential threat. But it is dismaying that DHS will issue a fuzzy news release to justify presidential assertions, and then refuse to explain how the numbers were calculated. The president even falsely claimed to a crowd of supporters that 300 names had been published. At far as we can tell, Mexican officials have only identified two people by name. While a sampling of crimes is identified, these crimes appear to be associated with the migrants already deported by Mexico. Since DHS will not break out a list of crimes, we suspect most of these people with “criminal histories” are not actually violent. That aligns with the information provided by Mexican officials tracking the caravan, though the president called them “rough, rough people.” We also do not know how many people said to have criminal histories have actually dropped off from the caravan and are staying in Mexico. Still, numbers issued by DHS — 270 to 470 — are roughly consistent with the percentage of people with criminal pasts — 5 percent — in the 2014 surge. So it may not be completely out of line even if the possible criminality is hyped. Thus we will keep this at Three Pinocchios. in a rally in Huntington, W.V.